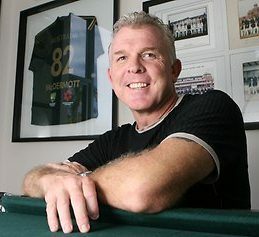 After bursting onto the scene as a 20-year-old in England in 1985, when he took 30 wickets in six Tests, Craig McDermott had a stop-start, injury-ravaged career (which included a twisted bowel and a broken ankle) but fought back to establish himself as Australia’s premier strike bowler in the early 1990’s. McDermott was not as fiery as his red hair suggested, nor did he capture the public imagination in the manner of Dennis Lillee or Shane Warne, but he was a textbook outswing bowler with a classic side-on action who could run through any batting order on his day. He was also a thumping batsman in his youth. Like all self-respecting Aussies, he saved his best for England, with 84 wickets in 17 Tests, including two eight-fors and eight of his 14 five-fors. His best performance was probably at Perth in 1990-91, when he took 8 for 97 as England collapsed from 191 for 2 to 244 all out. Injuries hit McDermott again towards the end of his career: he missed the best part of the 1993 Ashes tour, as well as the famous victory in the Caribbean in 1994-95 and the World Cup a year later. Post his Cricket career Craig went onto carve out a very successful career is business that makes him one of the most interesting stories in Australian Sport.